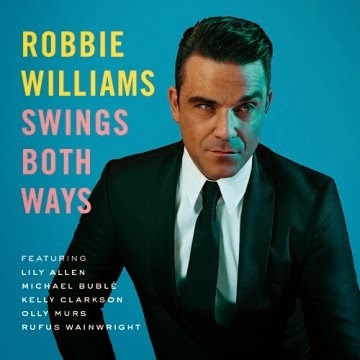 This past November marked the next chapter in the Robbie Williams legacy, as he released his latest album, "Swings Both Ways." I knew "Swings Both Ways" may not be my cup of tea. It's a follow-up to his super popular "Swing When You're Winning" from about a decade ago, which was a cover of a lot of old standards. I knew this new album would be a mix of covers and new tracks. I'm not always 100% interested in old standards (although his voice does always sound great) but I tend to like some of the new stuff. ("I will talk and Hollywood will listen" from "SWYW" is fabulous!) This album proves to be just as I expected. I had super high hopes after the first two tracks, "Shine My Shoes" and "Go Gentle." But then it pretty much goes downhill from there. The swing version of "Supreme" and the title track are OK, but I don't even know that I would recommend paying to get them on iTunes. I knew this album would be different, and it is. It's not bad, it's just not the Robbie that I love. However, if you're into standards, you'd probably love it. By no means am I giving up on my main man in music, but I probably wouldn't recommend this venture. Here's hoping it's not too long before he comes back with some great stuff for me to jam to in the car!